JEWELS held a press conference today at the DEEP gym to announce several pro wrestlers being added to the Sept. 13 Shinjuku FACE show. They also announced the brackets for the 60kg ROUGH STONE tournament. The other tournament brackets haven't been announced yet. The big news is that women's MMA pioneer Megumi Yabushita will face pro wrestler Atsuko Emoto in an Open Weight match. Yabushita has done MMA and pro wrestling for her entire 12 year career. Her record is 17-15 and her most recent match was a win over Emi Fujino on the July 21, 2008 GCM Demolition show. She's still active in pro wrestling and currently holds the JWP Tag Team Titles with Commando Bolshoi. Emoto is a veteran pro wrestler with a 2-2 MMA record and her last fight was a loss to Gisele Marquez on the Apr. 25, 2008 SMACKGIRL show. She also works as a trainer at the DEEP gym. JEWELS also added two fighters to the 60kg ROUGH STONE tournament and the brackets. In the first match, undefeated Shizuka Sugiyama will face German fighter Alexandra Sanchez. Sugiyama is 5-0 and won over Hitomi Sakamoto on Sunday's Shoot Boxing show. Sanchez is a kickboxer who won in her MMA debut over Tanja Hoffman on the June 28 MMA Berlin show. Apparently she contacted JEWELS and offered to pay her own way to Japan. The other match will have BATTLARTS pro wrestler Chihiro Oikawa facing Ito Dojo pro wrestler Tomoko Morii. Oikawa is 1-1 and won over Harumi on the May 16 JEWELS show. 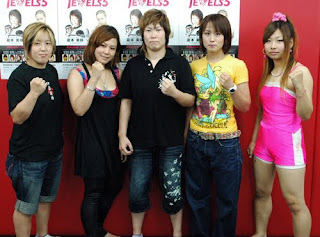 Morii lost to Megumi Fujii in her pro MMA debut on the Nov. 16 JEWELS show. Mika Nagano was at the press conference and will be in the 54kg tournament. The brackets have yet to be announced. She made her pro wrestling debut on last Sunday's Ice Ribbon show. JEWELS matchmaker Shigeru Saeki announced that actress/pro wrestler Hikari Shida will participate in a grappling match against an opponent TBA. Shida starred in the joshi puroresu film Three Count and also wrestles for Ice Ribbon. left to right in the pic: Morii, Shida, Emoto, Nagano, Oikawa. When will Roxanne Modafferi fight again?